Dubspot and Sonos Studio have teamed up to bring you an immersive and interactive set of workshops celebrating electronic music culture and technology in Los Angeles. The first one kicks off next week with a discussion on sampling techniques with Salva, Mike Parvizi, and Mark de-Clive Lowe. Dubspot and Sonos Studio have teamed up to bring you an immersive and interactive set of workshops celebrating electronic music culture and technology in Los Angeles. Do More Than Just Listen offers unique interactive learning experiences focused on electronic music history, music for film, live performance, sampling, music production, computer music, synthesizers, and more. 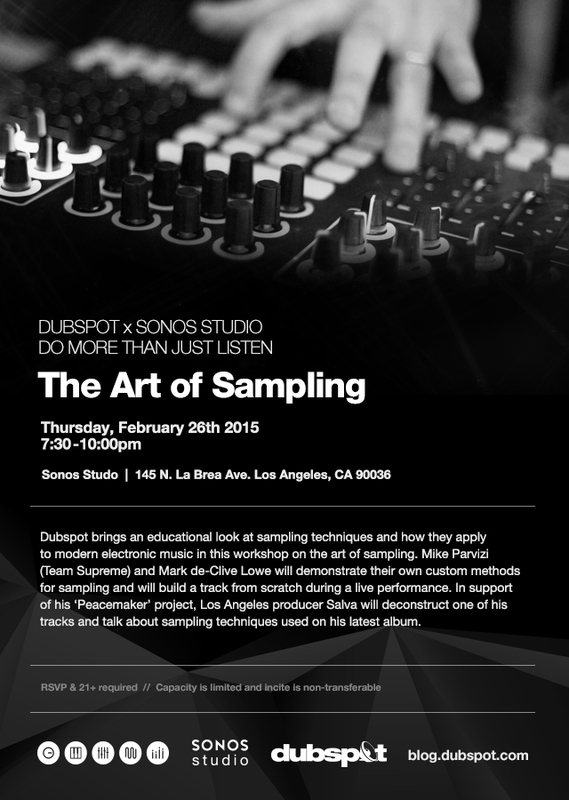 Dubspot brings an educational look at sampling techniques and how they apply to modern electronic music in this workshop on the art of sampling. Mike Parvizi (Team Supreme) and Mark de-Clive Lowe will demonstrate their own custom methods for sampling and will build a track from scratch during a live performance. In support of his ‘Peacemaker’ project, Los Angeles producer Salva will deconstruct one of his tracks and talk about sampling techniques used on his latest album.